Bored with bouncing, this kangaroo apparently decided to try his hand at swinging. 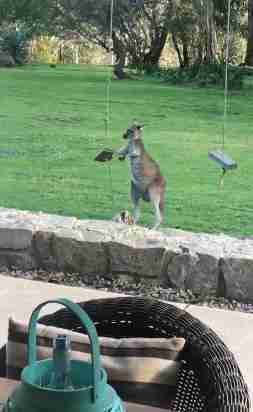 Anita Kuhberger spotted the playful 'roo outside her home in Australia on Saturday. He’d become fixated on a rope swing hanging in the yard, and appeared to want to climb atop it. Despite the kangaroo's best efforts, however, the pesky swing simply refused to cooperate. But like some uncoordinated (albeit determined) kid, he kept on trying. It was quite a show for Kuhberger. "We have a lot of kangaroos that frequent the property," she told The Dodo. "I have never seen any of the kangaroos do this before." The struggle was real — but don't feel too bad that his swing plan failed. Soon, the kangaroo was contentedly back to bouncing. "After the camera stopped, he still hadn’t finished playing," Kuhberger said. "He hopped around the yard very quickly a few times, something that I have seen them playfully do before." It's fair to say Kuhberger's day was made.